VASCO Data Security has had an incredible year. Can its 230% rally continue into 2015? 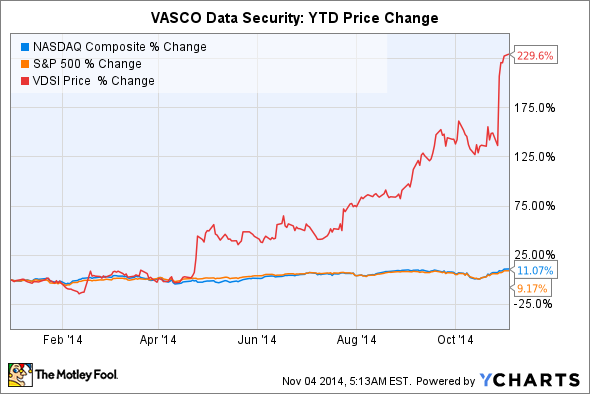 Cybersecurity company VASCO Data Security (NASDAQ:OSPN) has had a spectacular year. The company repeatedly crushed analyst earnings estimates over the past year, which fueled the stock's 230% year-to-date rally. The rise of data breaches across the world has substantially increased demand for VASCO's hardware and software security systems, which include user authentication products for employee, consumer, and e-commerce needs. But after such huge gains, does VASCO stock still have room to run? VASCO sells four main product lines -- DIGIPASS, aXs GUARD, VACMAN, and IDENTIKEY -- to financial institutions and enterprise customers. DIGIPASS is a system which dynamically generates one-time passwords. aXs GUARD Identifier adds two-factor authentication by combining a DIGIPASS password with an electronic signature. VACMAN products are bundles of utilities for businesses to secure their existing networks and software with DIGIPASS authentication. IDENTIKEY, a lower-end product, is a server which can be deployed to small and medium-sized businesses to secure their remote access infrastructure. As of Nov.3, the Identity Theft Resource Center (ITRC) has identified 644 breaches across the business, banking, government, education, and healthcare sectors in 2014, which together exposed more than 78 million individual records. The frequency of breaches is rising at an alarming rate -- the ITRC reported 614 breaches in 2013, 470 in 2012, and 419 in 2011. That's why it wasn't surprising when VASCO's Banking unit revenue climbed 37% while Enterprise and Application Security revenue rose 23% last quarter. That growth is expected to continue as more institutions and companies shore up their defenses against hackers. Research firm Gartner expects worldwide spending on information security to rise 7.9% year over year to $71.1 billion by the end of 2014, then grow another 8.2% in 2015 to hit $76.9 billion. Last quarter, VASCO's earnings of $0.28 per share doubled the $0.14 per share analysts polled by Thomson Reuters had expected. Its revenue of $52.6 million also topped expectations by $9.8 million. VASCO also raised its full-year guidance throughout the year. Back in February, the company expected 2014 revenue to come in between $160 million to $165 million, ahead of the consensus estimate of $159 million. In April, the guidance was raised to $168 million to $172 million, then to $175 million to $180 million in July. Following the company's third quarter earnings, it raised its guidance again to $190 million, suggesting 22% year-over-year growth from fiscal 2013. EMC is fundamentally cheaper than VASCO in terms of sales and earnings multiples. However, VASCO's higher multiples are certainly justified by its strong earnings and revenue growth over the past year. Its forward P/E of 28 also seems quite mild after its massive rally. Looking ahead, VASCO will benefit from a fear of costly data breaches across multiple industries. In my opinion, VASCO is a much cleaner "pure play" on data security, since EMC, and other publicly traded rivals, are also diversified across other businesses. Therefore, investors who are looking for a smaller, streamlined, higher growth play on the growing cyber security industry should keep an eye on this soaring growth stock.